Junior Boy ~ Justin Day has performed remarkably well as the Junior Boy’s A team goalie. His fearless defense of the net, quick reflexes, and impressive kicking radius and accuracy have made him an integral part of our success this season. Well done, Justin. Junior Girl ~ Kayla Jarvis brings tireless and aggressive play to all games and is a defensive strength no matter where she plays on the field. Kayla knows how to put on the pressure, and her versatile dribbling skills allow her to maintain possession and smoothly move past opponents. She has already made her mark at KES as a dedicated and talented, all-around athlete, and this season on the soccer pitch she showed endurance, focus, and fight for the duration of every game. Senior Girl ~ Claire Englehutt had a wonderful 2-game stretch during our basketball season opening weekend vs 2 Nationally Ranked CCAA College Teams. To think that Claire’s last game in the 2018 High School basketball season was against Avon View High School, and the summer was spent playing on the Nova Scotia Under 16 provincial team, the fact that Claire had significant immediate impact at the College level is outstanding. In the match up versus Holland College, Claire had 12 points, 15 rebounds (awesome), 4 blocked shots (incredible) and 1 steal. The next day versus Mt Allison University, Claire continued her strong play with 5 points (Mt. A changed their defence to double team Claire), and another incredible rebounding day with 12 boards, 3 blocked shots, and 1 steal. Senior Boy ~ Bryson Uberoi was a stellar hockey player at the PSHF showcase in Rockland, Ontario this past weekend. Although the two games resulted in a 2-1 and 3-2 loss, Bryson made many key saves to give his team a chance to win both games. Bryson’s calm demeanor and attitude as well as his determination to stop pucks allows his teammates to play with confidence and trust. Junior Boy ~ Harrison Klein joined the B Boys Soccer team for a game to strengthen our striking against Armbrae Academy. He stepped up his game by scoring two late goals to tie the match 5-5. He was a skilled attacker and boosted the morale of our young team with his confidence and fitness. Junior Girl ~ Gabby Strickey played her strongest soccer game of the season in our last league game versus Horton High School. Counted on for her fast feet in the fullback position, she made solid tackles and created a wall between the opposition and our goal, shutting down shots and plays and letting almost nothing get by her. Gabby’s impeccable timing when clearing the ball, her powerful kicks out of our end, and her consistent leadership, set the tone for our team’s best game so far this year. Senior Girl ~ Andrea Tovilla Rivera is a dominant player on the volleyball court. In our last game against Central Kings, she landed multiple points with her powerful attacks and consistent serves. She hustled to get every ball and was able to receive tough attacks from the opposing team. Her smooth passes to setter allowed our team to prepare for an effective offensive play and kept CK on their toes. Great work, Andrea! Senior Boy ~ Pablo Guerrero has proven to be an incredible goalkeeper not just in the last week, but the entire season of the Junior Varsity Boys Soccer team. He routinely made impressive stops when the odds were stacked against him providing a huge boost of confidence and fire to the team. His positive attitude, along with his quiet confidence, was a large part of making our season a positive one. Healthy minds need healthy bodies to house them. We have great ways to stay active and healthy all year long. 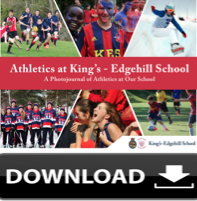 Download the Athletics Photojournal for examples and pictures of our three seasons of sports.